Kunstlicht kicks of the new year with a new issue and a new opportunity. Connected Dots, Kunstlicht’s latest issues, deals with issues of inter- and cross-mediality. Its title was inspired by connect-the-dots puzzles: at first sight randomly placed numbered dots that combine into a recognizable shape once connected. Crossmedial artworks are like connect-the-dots drawings, in that they are made up of a variety of fragmented or isolated media that complement or contradict each other, and which, when combined, produce meanings that transcend the sum of its parts. The issue features work by several artists. The cover is part of a small crossmedial exhibition Jan Robert Leegte set up for this publication. It can be visited on various locations, both offline and online. 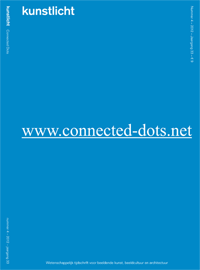 The inner and outer covers of the paper issue show hyperlinks that refer to the following works of art: www.connected-dots.net, www.randomselectioninrandomimage.com, www.bluemonochrome.com and www.hypermaterial.com. The latter could be considered an exhibition text. Furthermore, Connected Dots contains a survey of Paradiso Phone Expo, an existing exhibition concept that operates through ‘visitors” smartphones. This and other articles can be downloaded as pdf. Visit Kunstlicht for more! Want to contribute to a new issue of Kunstlicht? Check out our Call for Papers section, which features a call for the magazine’s Fall 2013 issue Mind the Map, which will focus on art and cartography. You can also download the details here.